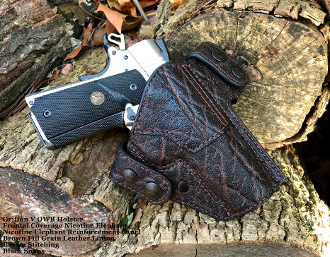 The Griffon V OWB is an outside the waistband snap holster first designed by the late Bruce Nelson. The Brigade Gunleather M-5 Aspis is my inspiration for the design of the Griffon V.
Easy on/off removal of holster via 2 pairs of directional "Pull the Dot" snaps. Molded front sight channel. Designed with a 15º forward grip rake. Optional sweat shield/body guard & leather reinforcement panel available upon request.